Super clean noodle salad jam-packed with flavor, color, and crunch? Coming right up! 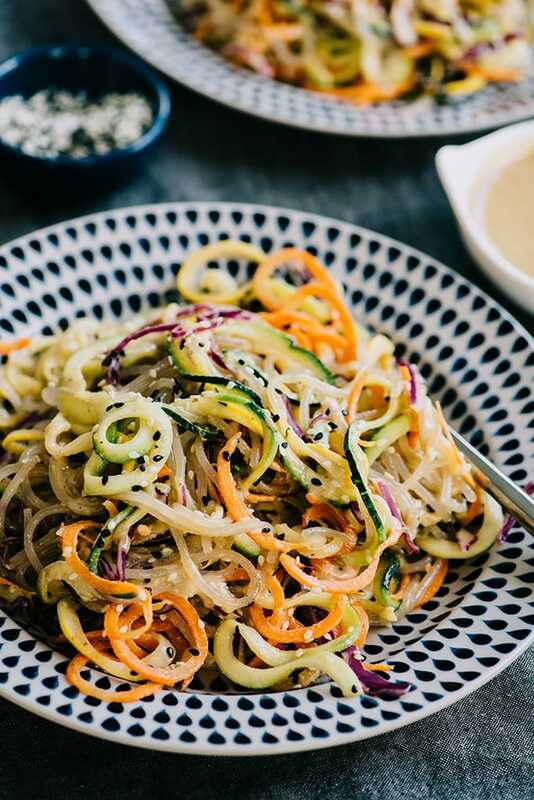 This glass noodle salad is so easy to toss together for lunch, dinner, or meal prep. 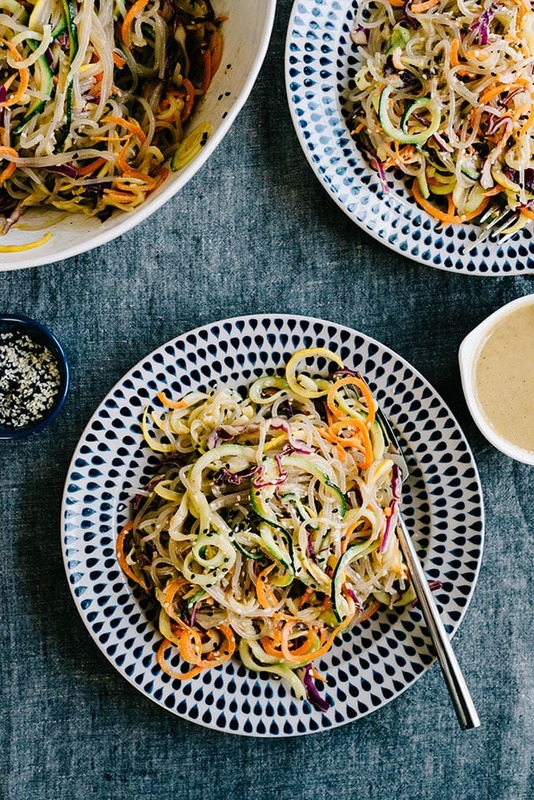 Made with a rainbow veggie medley and a zesty sesame ginger dressing, it’s so flavorful and dare I say addictive? Yes. Yes I do. 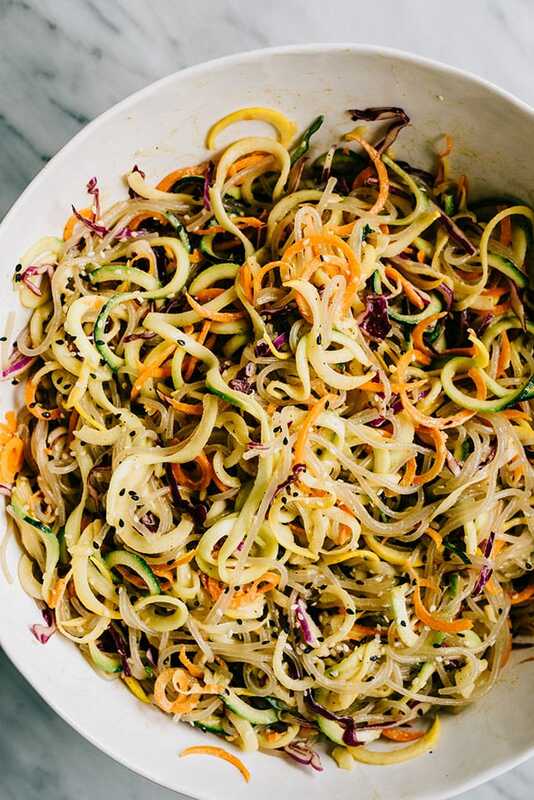 Whether you’re paleo, gluten free, grain free, vegetarian, or something else, you’ll go crazy for this easy, healthy noodle salad! Oh, hey there. My name is Danielle and I’m super addicted to colorful crunchy salads that my kids won’t touch, but that I continue to make day after day, week after week because I’m a little bit of a masochist and I just want clean, healthy food that doesn’t take up all of my hours and spend all of my dollars. 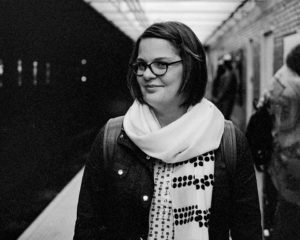 That was a lot to get out, and I’m super relieved to come clean with y’all. But honestly and seriously, I don’t know what’s happened to my children this summer. They have devolved into fist-shaking tiny humans who cry havoc at even the tiniest hint of a colorful vegetable on their plates. Does that sound like your situation too? Phew. Let’s start a club. We’ll eat delish salads while our children starve eat endless PBJs, and we’ll throw away any mom-guilt at the door because fed is best, and dinner is peaceful. Deal? Sweet. First recipe up? 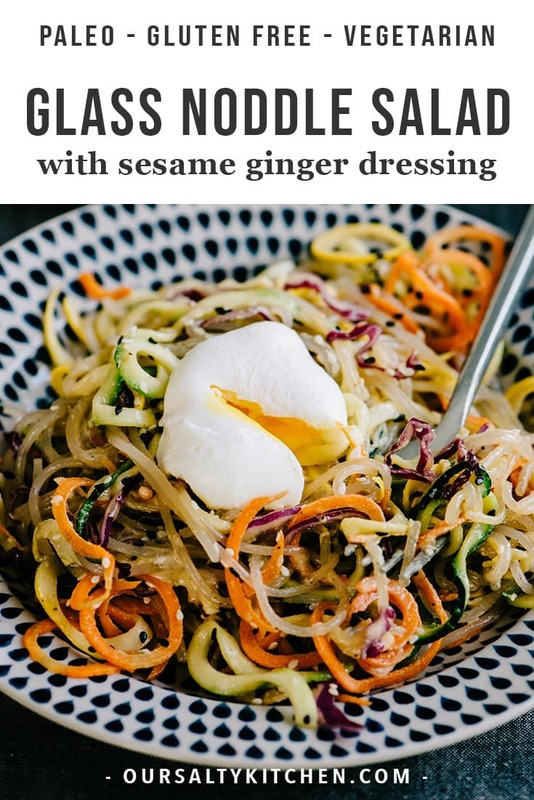 Sweet potato glass noodle salad with so many vegetables and a tangy sesame-ginger dressing situation that my kids won’t touch with a ten-foot pole. Winner winner healthy dinner! >>> Pin it now, make it later! 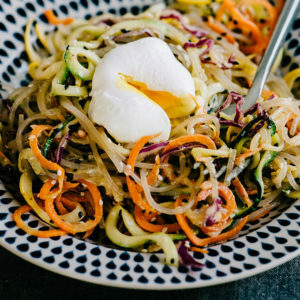 Click here to pin this Glass Noodle Salad to your Healthy Salads Board on Pinterest. What are Sweet Potato Glass Noodles? 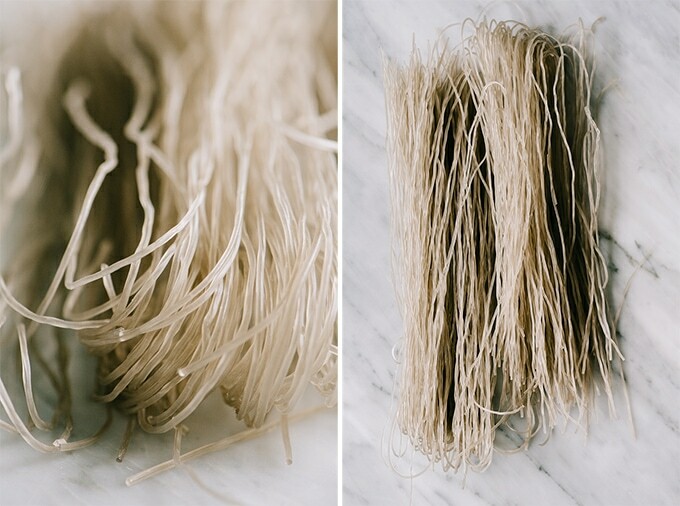 I was first turned onto these glass noodles when I worked with them in a recipe for a freelance food styling client. “Immediate addiction” isn’t hyperbole, and I was pleasantly surprised to learn that they were readily available in the Asian grocery section of my supermarket, and even happier when I realized they weren’t a gazillion bucks a bag. Sweet potato glass noodles are made from sweet potato starch. Once cooked, they become nearly translucent and have a reflective quality. So pretty. As opposed to rice noodles, they don’t get gummy once cooked, which I super appreciate. They have the same weight and texture as spaghetti, but a little more slippery, so you’ll need a sauce with a little stickiness for dressing them up proper. Flavor-wise, glass noodles are a blank slate. They’re totally tasteless, and easily take on whatever flavors are present in the dish. They’re an excellent paleo, gluten free, and grain free alternative to rice noodles. 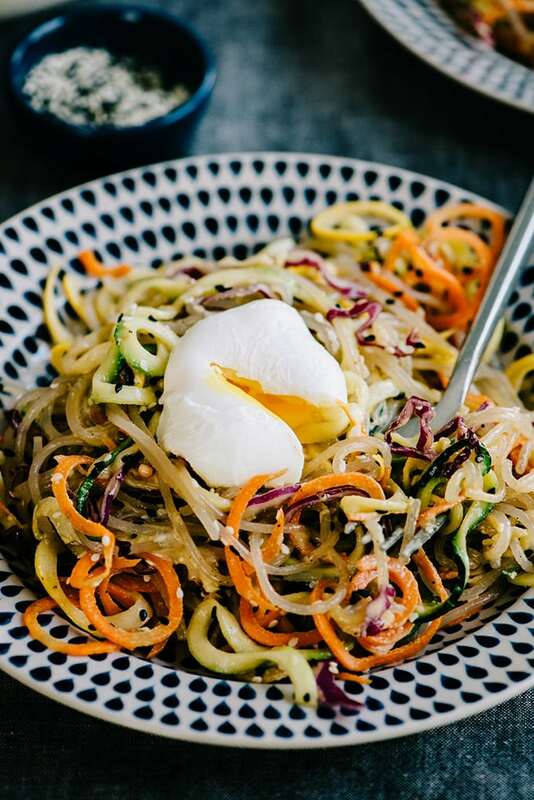 Sweet potato glass noodles are most frequently used in Asian recipes, but I’m a rebel so I use them as a catch-all pasta substitute and toss them with flavors from all cuisines. Salad isn’t salad without a knock-your-socks-off dressing, and this sesame ginger vinaigrette is just that. Yes, that’s a lot of flavor happening in one sauce. You’re welcome. The dressing is 100% paleo compliant, and made start to finish in a blender. Don’t attempt to make it by hand – it really just won’t turn out the same. Just toss all the ingredients into the blender (you don’t even need to slice the ginger! but do peel it) and whiz bam, thank you ma’am, your dressing is done and it’s divine. DO taste for seasoning and adjust to preference. A little more honey for sweetness, a little more vinegar for acidity, a little more coconut aminos for umami. 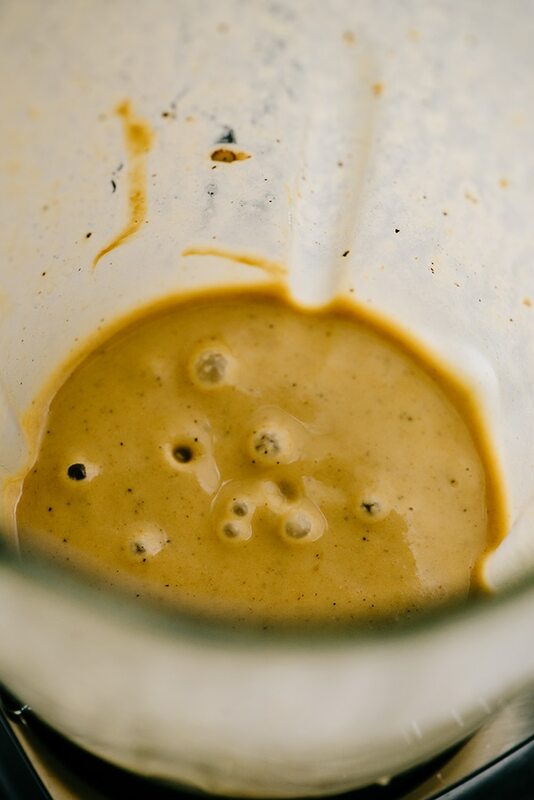 Be forewarned that this vinaigrette is strong on flavor straight off the spoon, and it’s intended to be. It chills out once tossed with the noodles and veggies, so don’t tame it too much. 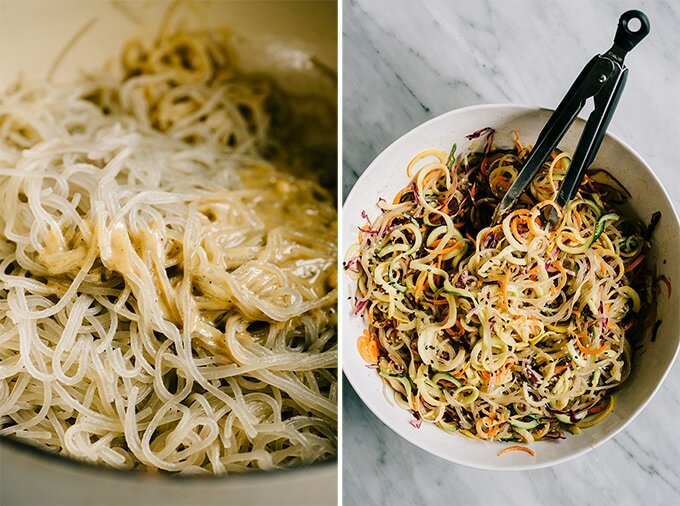 This glass noodle salad is light and fresh, but super filling. Add a poached egg, sauteed shrimp, or grilled chicken if you need a kick of protein. Be sure to cook the glass noodles all the way through, and then rinse them in cool water to stop the cooking process and prevent them from gumming up. Equally delicious warm or cold, this salad is a terrific recipe for paleo meal prep. Cook the Sweet Potato Glass Noodles. The only real “cooking” involved in this recipe is the glass noodles. Set a large pot of water over high heat and bring that guy up to a boil. You need a very large pot, similar to whatever you’d cook spaghetti in, and about 4 quarts of water. The noodles are long, so they need space to move around. Big pot, lotsa water. Bingo. If you want, gently break the noodles in half where they’re folded over, then add them to the boiling water. Cook for about a minute, then stir and break them apart with tongs so each noodle can fully cook. Boil for an additional 5-6 minutes. Test a noodle for doneness by biting into it. It should be tender, with an al dente texture, and cooked through the center. Drain, then rinse the noodles until cool running water to stop the cooking process. Give the noodles a really good shake to release as much water as possible, then return them to the pot they cooked in. It should still be hot, and will help evaporate any remaining moisture. Prep Your Veggies. While the noodles are cooking, prep your veggies. 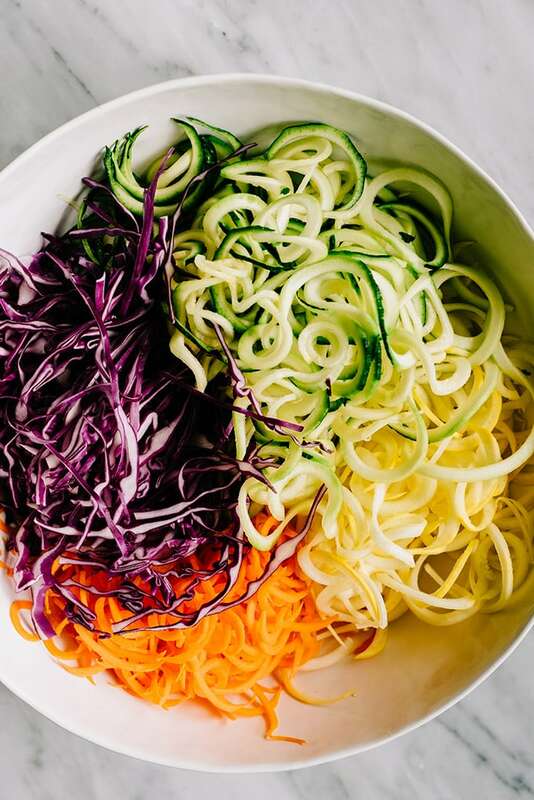 Grab a zucchini, squash, carrot, and some cabbage and get spiralizing – or mandoline-ing – or slicing. Or all three. 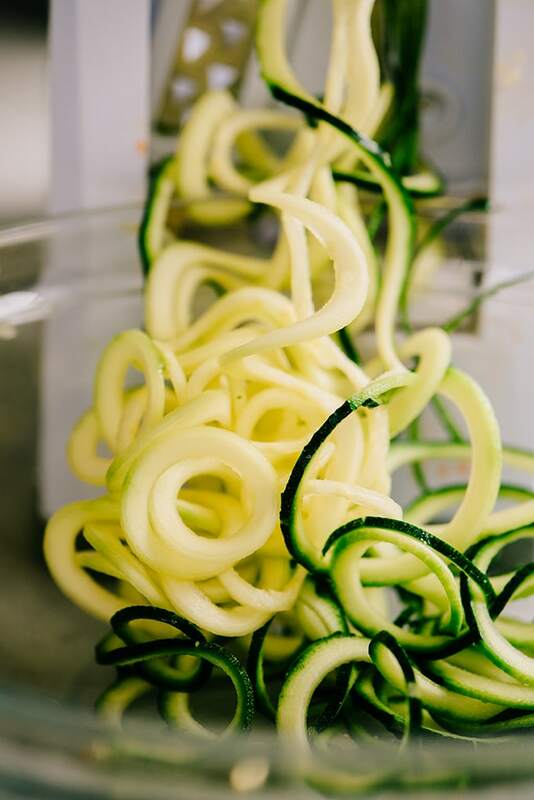 I recently purchased a spiralizer so I could see what the hype was all about, and TBH, I’m a little bit impressed – this is not an easy feat, just ask Cameron. I’m not really a gadget kinda lady, but I can see myself using this one with frequency. Mmmm, hmm. A rainbow bowl of delicious. Sauce It, Toss It! Toss the cooked noodles with about half the sauce. Remember, the noodles are slippery, so you want to coat them with sauce first. This will make distributing the veggies into the noodles a much easier process. From here, this glass noodle salad is your oyster. Eat it as is, add a poached egg (I did, and you should too), or shrimp, or chicken (or all three? I’d totes do that too). Enjoy it warm, or cold straight from the fridge. It’s all yum. Supplies almost half your Vitamin A and a third of your Vitamin C, so stock up on this salad if you’re feeling sniffly. This is a great meal prep salad – it holds up well in the fridge for at least 3 days (mine didn’t last longer than that). I was totally full on salad alone, but if you need additional protein, add flaked salmon, sauteed shrimp, or grilled chicken. Have it for lunch or dinner with a poached egg. Easy peasy. Serve it as a side dish with egg drop or thai coconut chicken soup. 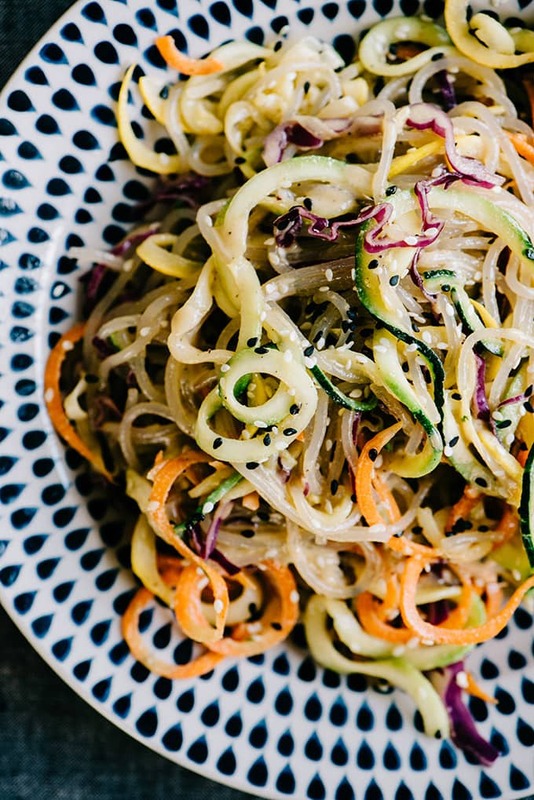 DID YOU MAKE THIS SWEET POTATO GLASS NOODLE SALAD? I WANT TO SEE YOUR CREATIONS! SNAP A PICTURE AND SHARE IT HERE ON PINTEREST. Bring 3-4 quarts of water to a boil in a 6-quart dutch oven or large soup pot. Add the sweet potato glass noodles, breaking in half if desired. Do not salt. Gently stir after one minute to break apart the noodles. Continue boiling for an additional 5-6 minutes until the noodles are bite tender. Remove from heat, then immediately strain the noodles and run them under cool running water to stop the cooking process. Stake to release as much water as possible, then return the noodles back to the hot pot, where the heat will help any residual water evaporate. While the noodles are cooking, prepare the sesame ginger dressing. Place all ingredients into a blender or food processor and blend until smooth. Taste for seasoning and adjust the sweetness (honey), acidity (vinegar), or umami (coconut aminos) to preference. Add half the dressing to the noodles and toss thoroughly. Add the vegetables, sesame seeds, and remaining dressing to the noddles in stages, tossing after each addition until all ingredients are evenly distributed. Portion the noodles into bowls. Top with a poached egg, flaked salmon, sauteed shrimp, or grilled chicken if desired and sprinkle with sesame seeds. Serve immediately. Alternatively, portion into meal prep containers and store in the fridge for up to 5 days.